Every sea is different, but all of them are connected. Oh, there were the usual variations. Temperature. Salinity. Pressure. She knew them, as any merfolk did, by instinct. A landbound oceanographer might spend a lifetime learning to measure what a merfolk knew in infancy. Just another way they're inferior, really. But there were other things, things the landbound didn't even have words to describe, other sensations that painted her vision of the world. Taste was the closest word, although in truth it wasn't very close. This water, here, on this world, flowing over her gills... tasted different than anywhere else, on any world. And nowhere tastes like home. This plane was pleasant enough. The seas were warm, the mana was rich, and the wildlife was plentiful, even if it was a bit... small. One of the locals had shown her how the drakes here plunged straight from sky to sea and back again, and waxed eloquent about their mastery in moving between realms. She'd said nothing. It seemed polite. In any case, he clearly couldn't help her. Home. She longed to return to her own world, with its wild and cantankerous temperament. Most worlds were whales—elegant, peaceful, toothless. 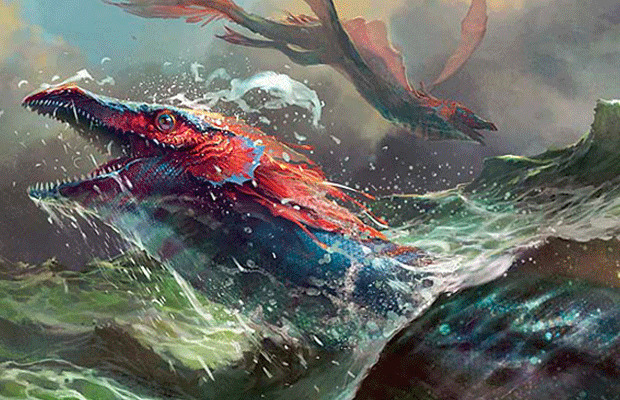 Zendikar was a shark, and it had been too long since she'd swum in the presence of its power. But she couldn't return to Zendikar. Not yet. Not without a weapon to fight the monstrosities called the Eldrazi. And so her search continued. Planeswalking, they call it. Ha. She moved deeper, into darkness and cold and pressure. It helped her focus, to leave one world behind, to find another. She gathered the languid mana of the deeps and pushed against the walls of the world. It was risky, to venture out into the Blind Eternities with no destination in mind. But the sea helped. The sea guided. She burst into the void and swam, out of one ocean and into another. The universe fractured around her, and she tumbled through a thick and endless nothing. It was like being far beneath the sea, in the deepest places. The pressure was immense, all her senses blinded. All that remained was the vague sense of motion, and of things, worlds, immense and unthinking, drifting silently through this sea that was no sea. And then—somewhere. Light, and sound, and motion. Water. Another ocean. Kiora swam, and tasted a new world. Warm, clean salt water flowed through her gills, with not a hint of artificial contamination. There was a tang of sulfur—volcanism, whether on land or down in the deeps. An active world. The sun shone down through a hundred feet of crystal clarity, and swift strong currents pulled her along. From behind and above came the clumsy slap of oars and the creaking of dead wood. Here, as elsewhere, the landbound clung to their little rafts and crawled across the skin of her world—needing the ocean's bounty, fearing its mysteries. She glanced up at the little eggshell of a boat, a distant speck making its ungainly way across the sea. A glance. That was all it deserved. In a boat like that, they wouldn't be too far from shore—and, indeed, hazy with distance, she could make out towering cliffs rising toward the surface. Kiora swam in the opposite direction, tasting this new place, feeling out its mana. In the distance, some of the local wildlife frolicked at the surface—some kind of fish-horses, with two front hooves and long, scaled tails. 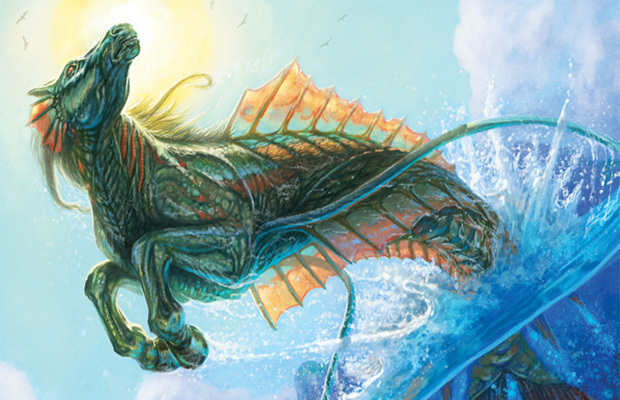 She'd heard of such things, even heard of merfolk riding them, but she'd never seen them. Well, now she could say she had. Beyond that, they did not interest her. She moved deeper into dimmer waters, reaching out with all her senses, straining for some trace of the great ones that dwelt in the deepest places on nearly every world. There was nothing—only a vast, deep darkness. She sent out a pulse of mana, calling them, but heard no answer. Kiora stopped, hanging in the water column, and began gathering mana. She was trying to catch the attention of some very big animals, and sometimes that took a very big spell. She floated, eyes closed, every spine and fin extended with the effort. Far beneath her, in depths where the sun could not reach, water began to move. Immense and sluggish currents flowed together directly below her, momentum building as more water rushed in. Inexorably, a massive pillar of water surged inward and upward, toward her. After what seemed like hours, Kiora swam back toward the surface, dragging an enormous upwelling of water behind her. She was throwing a lot of weight around, and if experience was any guide, the titans of the deep would emerge from their hiding places to investigate. The rush of water passed her, enveloped her, gaining speed as it thundered toward the surface. It was cold, brutally cold, and tasted of strangeness and age. She tumbled freely for a moment, savoring the sensation of the ocean as it truly was—not the chopping waves the surface-dwellers imagined when they thought of "the sea," but vast volumes of water and darkness where so much life and mana lurked unnoticed. The tower of water swept her up, splayed out as it neared the surface, and moved outward as a massive wave. Kiora surfaced, blinking as she adjusted to the sunlight and the air, and watched. In the distance, the boat she'd spotted earlier bucked and rolled beneath the wave, the sailors clinging to its masts and guardrails. She ducked under the water and listened. She couldn't see the wave hit the shore she'd glimpsed earlier, but she heard it. The ocean rang like a bell. Kiora waited, and listened, and watched. Waves slapped. Dolphins chattered. The surface of the water soon looked and felt exactly as it had when she arrived. The sea is ancient, but it has a short memory. She heard no further stirrings in the depths, sensed no roiling tide of flesh and hunger rising up to meet her. She knew they were down there. Where were they? She needed more information, and she wasn't going to get it here. More focus. More mana. A vast dark body took shape beneath her, a leviathan from another world. Planeswalking, wave-making, now summoning—she was pushing herself to the limit. But she wasn't in the mood to wait. The leviathan rose beneath her and she clung to its spines. It breached, and she laughed wildly before it, and she, slammed back into the water. She willed it toward that far-off shore, and it surged forward, tail pumping back and forth. Water and wind rushed past her in turns as the creature's enormous bulk broke the surface, heaved forward, and sunk back down to rise again. She'd been riding only a few minutes when a group of heads popped up out of the water in her path. Locals. Good. Now she might get some answers. 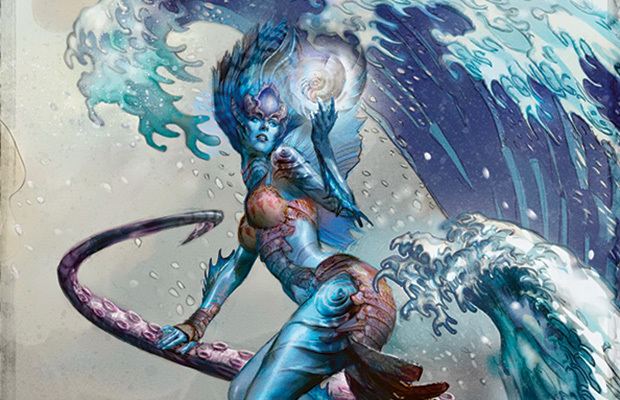 She willed the leviathan to a halt and stood as it settled patiently in the water, looming over the native merfolk. 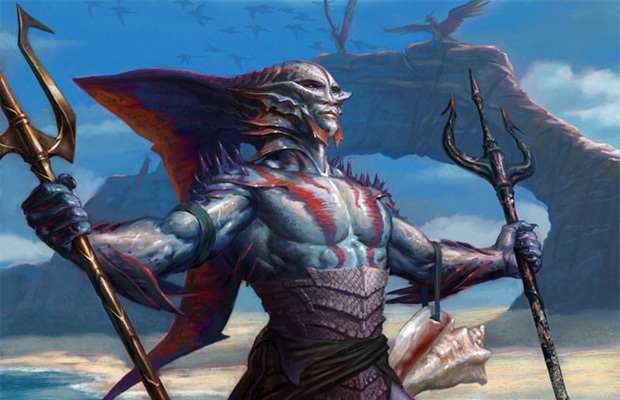 Each merfolk's head bore a tall crest that trailed out behind it. She would look as alien to them as they did to her, but that could be an advantage. A dozen pairs of eyes peered up at her, filled with fear and awe. That was a good start. "Where am I?" she asked. The natives exchanged glances, and one of them swam forward to speak. "Near the human polis of Meletis," he said. Useless. She glared down at him and waited. "In the Siren Sea," he said. She frowned and gestured all around—to the sea, the land, the sky. "Where am I?" she asked again. The speaker's eyes widened, and his fellows murmured to each other. She picked out Nyx and Thassa and something about the Silence. "You are on Theros," he said. "You are in the mortal world." She smiled but said nothing, letting them talk among themselves. There was something strange about this world, and she wasn't about to let on that she didn't understand it. "...Thassa herself, returned to us!" "...doesn't bear the mark of Nyx. How could she be..."
"Fool! A god can appear however she..."
God. Now that was interesting. "Enough," said Kiora. "You have questions." The speaker considered his words. He wasn't an idiot, then. Good. "Do you truly doubt me?" "Of course not," he said, eyes roving over the closed maw of the leviathan. "We tritons are ever in your service. Only..."
"That sounds like doubt," she said. "How is it that you defy the Silence, my lady?" "When Kruphix spoke, and the gods retreated into Nyx," he said, "we called their absence—your absence—the Silence. Our prayers go unanswered. The night sky is filled with darkness and unmoving stars. We are frightened." "I move with the currents," she said. "The Silence does not bind me." "We were led to believe it bound all gods," said the speaker. "It was a human's crime that brought the Silence," said one of the other tritons. "The Sun's Champion slew Nylea's pet hydra. Why should that matter to Thassa, or to us? Why should we suffer for the misdeeds of the drywalkers?" She silently commanded the leviathan to lower its head, so the water lapped at her feet. "You," she said, pointing to the speaker. "Join me." She held out a hand. The triton took it, and stepped up onto the leviathan's broad snout. He was taller than her, and handsome, in a strange way. The leviathan raised its head above the waves again, so the two could speak privately. "And do you believe I am Thassa?" "...No," he said. "I do not think Thassa would so brazenly defy the eldest of the gods." "Good," she said. "Then who do you think I am?" "I believe you may be her emissary, sent to guide us while she is absent." "Then I suppose we will find out who you really are," he said. "I like you," she said. "I also have a sea monster. Want to help me out?" He glanced down at the assembled tritons. The leviathan's jaws could easily close around all of them at once. "I would like nothing better," he said. "Good!" she said. "Now then. I'm looking for Thassa's mightiest children—leviathans, serpents, that sort of thing. I called, but none came. Where are they?" "The sea is vast, and even the tritons do not know its boundaries," said Kalemnos. "The krakens come when they will, or when Thassa does." "Then consider this a quest from Thassa," said Kiora. "If she is not here to plumb the depths for you, you must explore them yourselves. Hang on to something, will you?" 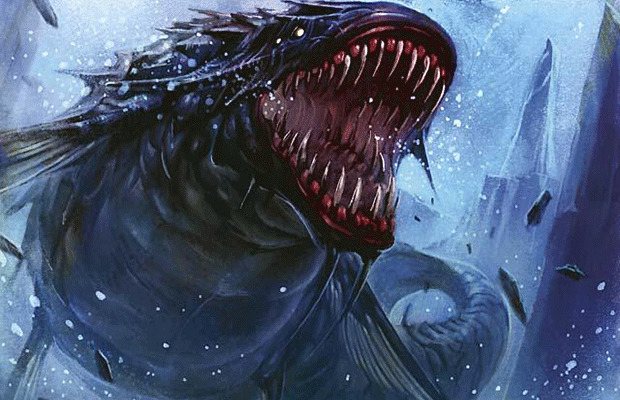 Kalemnos gripped one of the leviathan's fins as it turned and swam, keeping its massive head above water. "Follow me!" she yelled to the tritons. They vanished into the water and swam behind her, riding the leviathan's wake. She turned to Kalemnos, who was clinging desperately but bravely to the titan's pebbled back. "Now then," she said. "Tell me more about these krakens." 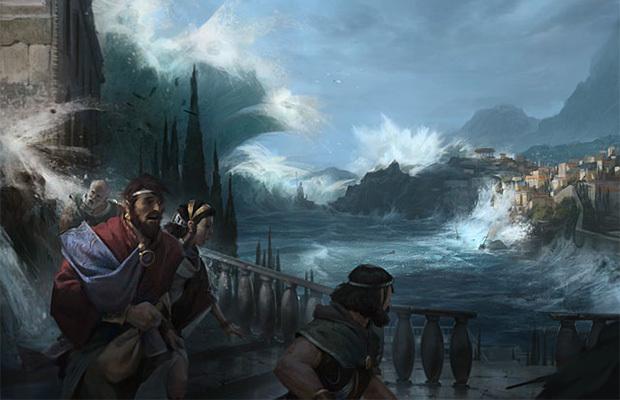 Kalemnos began to speak, about creatures that could lay waste to land and sea alike, fearsome monsters that seemingly only the gods could command. Kiora lounged on the leviathan's head, exhausted from her spellcasting but far too proud to show it. The sun warmed her skin, and the spraying sea moistened it. She rode in silence, enjoying the cadence of Kalemnos's voice and the power promised by his tales. The leviathan swam with steady strokes, away from the shore, toward the open water and all the secrets it held. They were hers for the taking. All she had to do was ask.